Type: Hardwood. Grows in United States, Canada, and Europe. 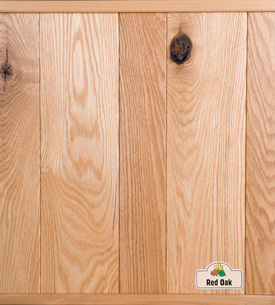 Other Names: Also known as Northern red oak, Eastern red oak, gray oak, American red oak, Canadian red oak, and mountain red oak. Physical Props: Hard, strong, stiff, and strong with moderate stability in use and little natural decay resistance. Working Props: Machines quite well but has tendency to splinter and chip - avoid cutting against the grain. Turns and steam-bends fairly well. Somewhat difficult to work by hand. Nails and screws satisfactorily although pre-drilling recommended. Glues satisfactorily. Finishes well with most stains and finishes but relatively large pores may require a filler. Uses: Used for cabinets, furniture, millwork, musical instruments, plywood, flooring, turnery, boxes, caskets, pallets, heavy construction, and many other applications.